Are you looking for piano practice techniques that are effective and give results? Here is a simple formula for getting through that first stage and learning the notes of a piece super-effectively. The best way to work with a new piece effectively, is to work with one to two small sections per day. Learning the notes of a piano piece with the "formula" below actually takes very little time, but is highly effective and intense! However, it might also feel really tiring. That is why it is a good idea to practice like this for only a short time. Then you can take a break, or play and practice something else. When learning a piano piece with effective piano practice techniques, you will build up security, knowledge and understanding of the piece faster. Additional benefits: With the following method it will also be easier to memorize the piece later! Start by dividing the piece in sections; 2-4 measures per section. Mark the sections with a pencil. The harder the piece is, the fewer measures, and if it is easier there can be more. Please note: Don't continue with a new section of the piece until all steps are completed without any mistakes. On the other hand there is no need to ever go backwards or repeat any previous step. Learn the right hand with notes. Learn the left hand with notes. Learn the both hands with notes, half of the speed you practiced hands separately. Learn the right hand by heart. Learn the left hand by heart. Learn both hands by heart, half speed. Learn the right hand by heart with metronome. You can gradually increase the speed from slow to the tempo it should be. Play both hands by heart with metronome. Start at half speed and work up to where you can play well without any mistakes. Finally, play also a few times looking at the piano notes again. This whole process might take you only about 10 minutes to do, but it is very intensive! By practicing in this way you will learn the piano notes very well, and you will not forget them easily. Please note that even though you'll practice each part by heart you are not yet memorizing the piece. It is better to keep the sheet music in front of you for more time, so that you will keep studying the score. However, this practice method does make it a lot easier to memorize when that time comes. If you feel up to it, continue with the next part. But you can also with good conscience let it “rest” until the next day. It actually gets better by letting your brain work on it by "itself"! In the meantime; polish other pieces, practice technical exercises, scales, and so on. Each day of practice, you'll continue by connecting all the previously learned parts together. 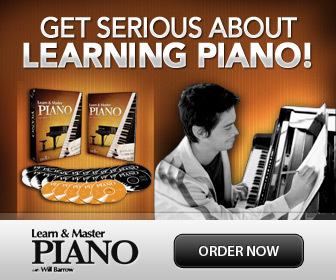 Practice Piano With Your Brain!